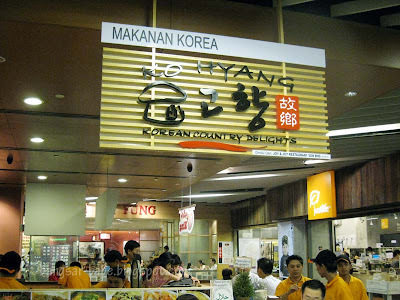 Ko Hyang is a no-frills place located at the lower ground of The Gardens, and it has a basic menu of Korean favourites. Don’t go there expecting waiters to grill your meat for you, they don’t serve grilled items — this place is similar to Haeun Khon in Amcorp Mall. Since the place is in the open, expect some hungry stares from people walking by, or going up or down the escalator. I was feeling peckish while shopping in Mid Valley, so I suggested an early dinner here. Ko Hyang gets pretty crowded during meal times, so it’s best to go there earlier, or later. As soon as we placed our orders, the banchan (side dishes) was served. 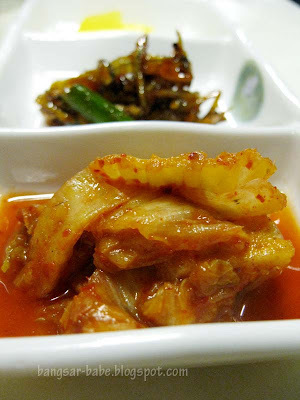 Only 3 types of banchan are available, including the customary kimchi. I didn’t care much for the other two, but the kimchi was decent. rif usually orders of beef bulgogi when he eats at Korean restaurants, but this time around, he chose the bibimbap (RM15.90). 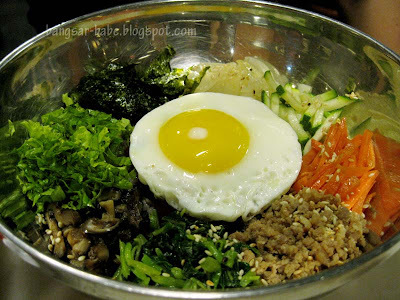 Bibimbap usually comes in a hot stone pot, but Ko Hyang’s version was served in a stainless steel bowl with a sunny side up. 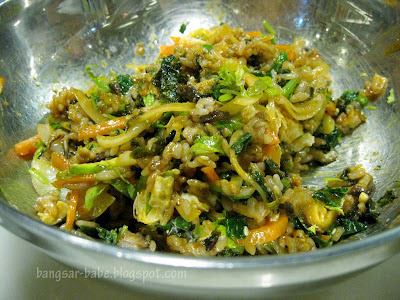 Mix this up and it becomes a colourful and tasty mixture of vegetables, minced chicken, brown rice, gochujang (Korean chilli paste) and runny egg. Flavourful and healthy-tasting. My bulgogi with rice (RM16.90) was quite decent, albeit its pale colour. 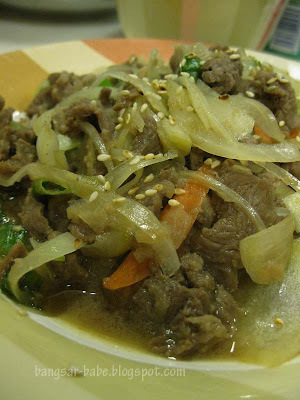 The tender beef slices were nicely marinated in a base of soy sauce, sugar, garlic and sesame oil. I liked the caramelised onion slices, which gave the bulgogi an extra sweetness. However, I prefer it to come with more gravy — it was too dry for me. 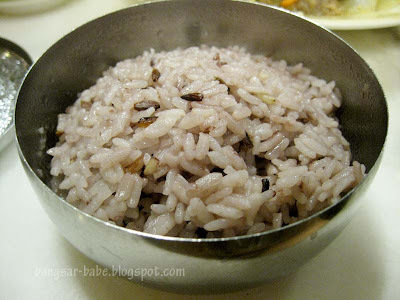 It comes with a bowl of sticky brown rice, which reminds me of the rice my mum makes me eat, only nicer. Verdict: The food tastes very homely with little or no MSG. Hey, I was there just last week! And ordered bibimbap too. 🙂 You're right, the taste is not too great and portion small… so I thought I could get better food with the amount paid. Hmmm I could get a BBQ set for RM20 at SS2's Korean House! 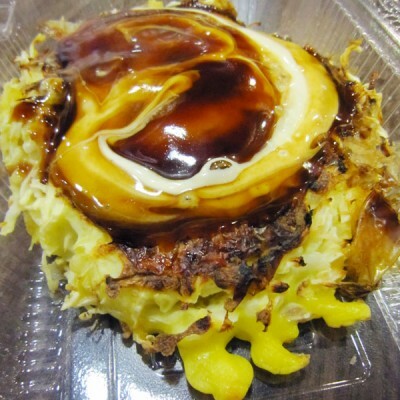 Go for the Seafood pancake (or Kimchi pancake? hmm) It's good. those brown rice are nutritious. I like Korean esp for their well marinated pork and spicy soup though I can barely stand the heat. r u going for the hannah concert this sunday? J – Hahaha…I'm jelez too. J2Kfm – Noted. Will order that next time. Thanks!